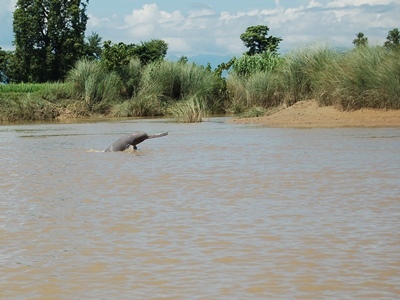 Lack of updated information about population number, their status and ecology and low level of awareness among riverbank fishing communities is becoming a major constraint in the conservation of Ganges river dolphin in the Karnali river of Nepal. This project is designed to improve knowledge about the Ganges river dolphin to assist policy makers in conservation planning. The main objectives are to determine the population abundance, distribution and conservation threats of dolphin, strengthening the capacity of stakeholder, assisting government in conservation planning and enhancing the community participation in conservation. Two sampling methods: direct count and line transect surveys will be used to estimate population status. Community-based dolphin conservation groups will be formed and extensive outreach programmes will be launched. The project is expected to deliver scientific information required for conservation planning with increased community participation in conservation.